CHICAGO (June 20, 2017) – The Rev. Elizabeth A. Eaton, presiding bishop of the Evangelical Lutheran Church in America (ELCA), has issued the following message in observance of World Refugee Day. Today is World Refugee Day. Observed every year on June 20, this is a day when we commemorate the strength, courage and perseverance of millions of refugees worldwide. There are more people fleeing war and persecution than ever before. We are now facing the largest global refugee crisis, with over 65 million people forcibly displaced from their countries. Twenty-one million of those who are displaced are refugees. The United States opens its doors to less than 1 percent of the world’s refugees – 85,000 refugees entered our country in 2016. In Matthew 25:35, Jesus said, “I was a stranger and you welcomed me.” As people of faith, we are called to welcome the stranger and to walk alongside vulnerable refugees living in untenable situations. This support is critical in providing protection and hope for those who have fled persecution because of their race, religion, nationality, political views and/or associations. As we recognize the global refugee crisis, let us also celebrate the many contributions that refugees make to our communities as they seek to stabilize their lives and build on their dreams. In this regard, we appreciate all the efforts of our congregations – in collaboration with Lutheran Immigration and Refugee Service – that are welcoming refugees and providing many forms of hospitality. It is also important to acknowledge the excellent work being done by The Lutheran World Federation, of which we are a member. These programs assist thousands of refugees every day who have fled their homes, such as South Sudanese now in Uganda, Kenya and Ethiopia; Burundians in Tanzania; Somalis, Eritreans and Sudanese in Ethiopia; and Syrians in Jordan, just to name a few. World Refugee Day offers an opportunity for us to stand in solidarity with people who have been forced to leave their homes. Today and every day we pray for peace for all the children of God created in God’s image. The ELCA is one of the largest Christian denominations in the United States, with more than 3.7 million members in more than 9,300 congregations across the 50 states and in the Caribbean region. Known as the church of “God’s work. Our hands,” the ELCA emphasizes the saving grace of God through faith in Jesus Christ, unity among Christians and service in the world. The ELCA’s roots are in the writings of the German church reformer Martin Luther. Pastor Dave is a native of western Pennsylvania. 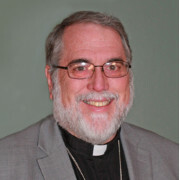 He has been an ordained minister for over 30 years serving congregations in northwestern PA and upstate New York. During his pastoral tenure, Pastor Dave was also a full-time chaplain for LutheranCare, a long term care facility located in Clinton, NY. He is a graduate of Thiel College, Greenville, PA and the Lutheran Theological Seminary at Gettysburg, PA. His ministry centers on Word and Sacrament, teaching, equipping the laity for service and leadership. He is also interested in ecumenism and Celtic Spirituality. Pastor Dave is married to Judith M Cole, a native of Buffalo and an artist. He is father and grandpa. His hobbies include winemaking, and Lionel trains.